Memento Mori has quickly become my favorite gift shop. This store, featuring gifts based on the Haunted Mansion, opened up a few months ago. There are many unique items to be found here and I recently had my face turned into the "aging man" portrait at this location. 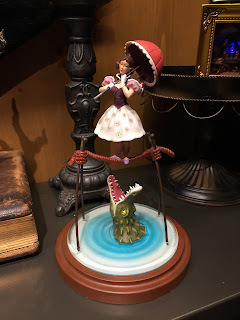 Here is a figurine based on the stretching room painting of the ballet girl over the alligator.